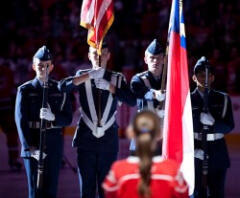 On Veterans Day 2009, Raleigh-Wake Composite Squadron was invited to provide the Color Guard for the NHL Carolina Hurricanes game at the RBC Center. In front of a crowd of 15000, four Raleigh-Wake Cadets presented the Colors, honoring all Veterans during the singing of the National Anthem. We got the notice from the RBC Center late Tuesday afternoon after a cancellation. Following our motto of “Anywhere, Anytime”, our cadets responded and put together a color guard on extremely short notice. I wish to express my appreciation for an Outstanding Job!